Emergency lighting is commonly found above or to the side of an emergency exit. They can also provide a secondary light source in the event of an emergency or power outage in a building or space. How do emergency light fittings work? 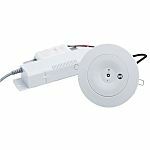 An emergency light fitting is designed with a separate, isolated power source, and can also be connected to a buildings main power circuitry. If there is an emergency, this kind of set up provides a backup and allows the lighting to turn or remain on automatically. Ensuring that people within the building or area have emergency escape lighting and can find safe passage out effectively. What is the difference between maintained and non-maintained emergency lighting? Maintained emergency lighting's purpose is to be lit continuously, and will stay lit when there is a power failure or an emergency such as a fire. A maintained emergency light will allow the pathways or areas to be permanently illuminated and usually helps guide people to exit signs and safety. Sometimes these types of lighting solutions can double up as a normal light fitting. Non-maintained emergency lighting has been designed to switch on in the instance of an emergency or power outage to help provide lighting to people who need to make their way to an exit or to follow an escape route. This kind of lighting solution provides a battery backup light source.  Bulkhead lights are strong and secure, usually encased in strong plastic and when installed are screwed into place. This type of lighting is very durable and have great resistance to the weather and damage.  Batten light fittings house longer bulbs and feature a lightweight aluminium body, this type of lighting is a great solution for providing illumination in large areas.  Halogen bulbs are an inexpensive solution to accommodate emergency luminaries. They use halogen gas to power them and produce a white light.  LED produce a high quality white light and offer a long shelf life, theyre also easy to replace.